The past century has not been kind to the people of the Korean peninsula. Only in the last decade has there been any significant move to heal the wounds of the past. The issue is complicated by the very different conditions of the two Koreas. The North remains a dictatorship, and having once led in economic development and industrialisation, is in economic decline. The South, by contrast, once viewed as an economic disaster, built a modern economy in the 1960s and 1970s, weathered the financial storms of the 1990s, and seems well on the road to democracy. The two Koreas are now interacting as never before. The 1988 Seoul Olympics and the 2002 World Cup, shared with Japan, have helped to increase knowledge about South Korea, but have not overcome widespread ignorance about the Korean people and their culture. Yet those who visit Korea, whether North or South, will find a place of great interest with much to offer. Koreans, when not constrained by politics or other considerations, are friendly and sociable. The peninsula has areas of outstanding natural beauty. The South’s cities, if not always beautiful, are vibrant and alive. The North, while very different, is well worth getting to know. Culture Smart! 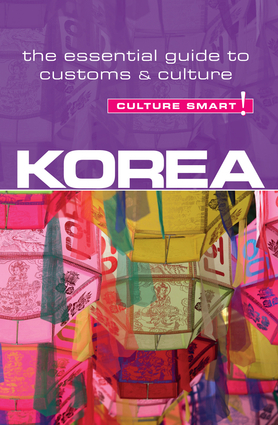 Korea shows how Koreans think and act, and the pitfalls to avoid, and introduces some of the delights of the peninsula. By introducing visitors to the Koreans at home and at work, their customs, attitudes and values, this book opens the door to the richly rewarding human dimension of foreign travel, and paves the way for an incomparably more engaging experience, whatever your reason for travelling. Do not be surprised if there is a lack of eye contact during conversations, or indeed at other times. Koreans do not like to look directly at people except for the shortest periods, since this is regarded as confrontational. They are not being shifty, merely polite by Korean standards.